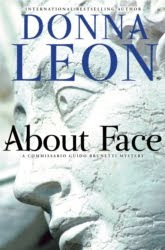 Author Donna Leon pens delicious mysteries -- all set in Venice and all centered on the delightful detective Guido Brunetti. Ms. Leon, an American, spent her early adulthood traveling the world as a teacher, but she settled in Venice and has lived there for decades. Her books are international bestsellers and are translated into 20 languages, but they were not readily available in the United States until just a few years ago. Thankfully, now they are. I'd hoped to meet Ms. Leon and interview her in person while in Venice, but she is a busy woman and will be out of town while I am there. She was most gracious, though, and agreed to answer a few questions via email. AKN: You are both traveler and writer and have lived all over the world. How did you come to settle down in Venice? Donna Leon: I first came to Venice, as a tourist, in 1968 and was lucky enough to make a friendship with two Venetians, who later married. For the next fifteen years, I came back to visit them at least once or twice a year and was gradually absorbed into their families. Thus, when I finally decided to settle down, I decided to come to the one place where I knew most people and felt most at home. They remain, almost thirty years later, my best friends here. AKN: Venice is a city renowned for its ex-pat community. For centuries now the British and Americans, particularly, have taken up residence there. Is it easy to immerse yourself in an Italian life as part of an ex-pat community? Or do you find comfort in being able to speak and think in English as well as in Italian? Donna Leon: I don't know the ex-pat community and know only two Americans here, neither of whom, to the best of my knowledge, is part of that community. Most of my friends are either Venetian or Italian. Thus I write in English but live in Italian. AKN: Tell us about the birth of your protagonist, Guido Brunetti. Now eighteen books later, how has your relationship with your charming Commissario changed? Donna Leon: When I began the first book, I had the good sense to choose a man I'd find sympathetic. Thus he is decent, intelligent, well-read, and has a sense of humor. He also enjoys the physical pleasures of life. After nineteen years, he has become a friend with whose thinking and prejudices I am familiar, just as I am with those of my other friends. AKN: Your books are all set in Venice – a fabled and often romanticized city. Do you strive for an authentic Venice, or do you find yourself changing the city to suit your literary needs? Donna Leon: This is the only place I've ever lived as an adult, thus it is the only city with which I am familiar. I suspect it is fabled, certainly it is romanticized, by non-Venetians. To those of us who live here it is merely a provincial city with crowded streets but which, upon occasion, can startle with it beauty and magnificence. I don't change anything. AKN: Commissario Brunetti inhabits a world filled with art, music, and literature. He’s married to a teacher. He lives in a city where the arts are central to the economy as well as the culture. He solves a crime which occurs at La Fenice, Venice’s opera house. This is unusual for a detective novel series. Why are the arts so important in your books? Donna Leon: You write as though you find it surprising that life should be lived with art, surrounded by and immersed in beauty. Art, by the way, is not central to the economy of Venice: cheap masks and plastic gondolas are. I'm afraid we're at loggerheads here, in a sense: I would not be interested in reading a book about a hard-drinking semi-thug who spent his time attending autopsies - heavens forbid I should waste my time writing one. It's also unusual for a detective to read Anna Comnena. But I do, so Brunetti does. He's married to a professor of literature, by the way. Arts and culture and music are important in the books because the books are a reflection of life, as novels are meant to be. Is a life without those things preferable or is that the norm? Beats me. AKN: "The Girl of His Dreams" treads into the thorny question asked by many Italians, “What do we do with the Roma?” How did you research the Roma (commonly known as “gypsies”) for this novel? What kind of conversations have you had with Italians about the gypsies in Italy? Donna Leon: I know one or two Roma, know police who arrest them, listen to what Italians say about them. And I read a lot. In general, Italians aren't very fond of them. AKN: You travel a great deal. When you return to Venice, what is the perfect way to spend a day in Venice? Where do you go and where do you eat. Donna Leon: I usually work in the morning, then meet my best friend for coffee, come back and work until seven, then either have friends to dinner or go to the home of a friend. In the afternoon I often go for a walk, not for any purpose, but to see a part of the city with which I am not familiar. If I do go to dinner, it's to Antico Martini or Cafe Saraceno. Fans of Ms. Leon's books will be interested in the interactive map on her UK webpage. Check out http://www.donnaleon.co.uk and click on "Donna's Venice" to read excerpts from her books and spot their locations on a map. A more complete list of locations featured in Ms. Leon's book can be found here. And author Toni Sepeda has penned Brunetti's Venice: Walks with the City's Best-Loved Detective , a guide to Venice as seen through Commissario Brunetti's lens. Donna Leon's books include Dressed for Death, Death in a Strange Country, Acqua Alta, Quietly in Their Sleep, A Noble Radiance, Suffer the Little Children, and The Girl of His Dreams. Her latest book, About Face , debuted in April. All of Donna Leon's books are available in The Gypsy's Store.